Many people have quite a bit of clutter in their homes. Families with small children especially have a lot of possessions to organize. Even if your home has adequate closet space, it may not be easily organized within the closets. 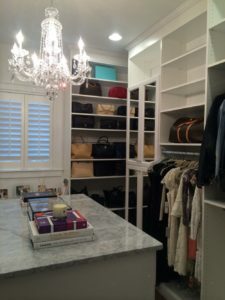 There are some very good ways that we can assist you in eliminating the clutter in your home with home closet solutions that allow you to get organized. With our home closet solutions, we can transform your existing closets into a useable space that allows you to get organized and store more within a smaller space. With customized shelving, drawers, and other features, we can convert your existing closet space into something more useable and systematized. One of the frustrating things about many closets is that it is just an open space where you must stack everything in boxes or totes. With home closet solutions, you can store your possessions in a more ordered way, and usually fit more into the closet than you could previously. If you don’t have enough closet space in your home, we can design unique closet solutions for you. You can let us know your needs for your closets, and we can design and install the closets in any space you choose. We can also expand or remodel existing closets to make them larger or more easily accessible. Our home closet solutions can be built into the new closet space, with shelves, drawers, and cabinets. If you are looking for a way to declutter your home, contact us today with your needs for an estimate. We will design the perfect closet space for you and your family so you can hide away your clutter, but be able to find it when you need it.